ESPAÑOL Oruro, the home of the Diablada, is located in the Western Andean highlands between three Bolivian departments and Chile. It is the third smallest department (state) in Bolivia and in addition to its colorful folklore, owes its fame to its mining industry. While they contained less wealth than their peers in neighboring Potosí, the silver mines of this region were also very desired by the Spaniards during the Conquest. The intrepid captain Diego de Almagro, the first European to travel through this region, arrived in the territory of the Urus in 1535. Here he founded Paria where, since the invasion of the Incas, the silver mines were already being exploited. This was the first Spanish town in what is now Bolivia. About fifty years later, in a region known to the Spaniards as Mesa de Plata, captain Francisco de Medrano arrived in the town of Uru Uru, about ten kilometers from the present-day city of Oruro and in 1585 he renamed it San Miguel de Oruro, having mispronounced the name, as Spaniards often did with indigenous names. Who were the Urus? These peoples inhabited the area far before the Tiwanacotas, thousands of years before Christ. Archeological and paleontological remains lead us to speculate that human settlements existed in the Andean highlands as far back as 10,000 B.C. At the time the area would have been a group of islands and islets surrounded by a large mineral-rich ocean that covered the entire Altiplano (high plateau). The capital of the Uru culture was located precisely where the Spanish founded Paria, and was much more ancient than the city of Tiwanaku. Little or nothing is known of this culture although remnants of this population still exist: today they are known as the Chipayas or Uru-Chipayas. They inhabit the lakes and salt flats of the department of Oruro where they build peculiar cone-shaped huts from adobe and reeds. There is a legend that tells of their origins and is, as usual, rather supernatural: it tells of gods shaped like animals who created them, then saved them from being attacked and destroyed by other spirits. The name “Uru” itself is legendary and means “from where the light is born”, alluding to their belief that they come from a mountaintop where the light touches the Earth. Myths aside, what we do know is that they were very skilled pottery-makers. When they were colonized by the Quechuas, they held a prestigious position because in those times clay and ceramic artisans were highly valued. Small communities lived at the same time they did, but much farther north. These were Aymara ethnic groups known as the Carangas, Quillacas and Soras. Later, at the beginning of the 14th Century, the Incan emperor Pachacutec and his son Túpac Yupanque sent their warriors to conquer and consolidate the Incan Empire in Western Bolivia. The Urus and other ethnic groups were incorporated into the Empire, and their region was converted into a “saya” (rather like a county) of the Collasuyo (the region assimilated by the Incan Empire). The Spaniards who settled in San Miguel de Oruro dedicated their time exclusively to mining. The town was very small and had only ten streets around its main plaza. Its urban area barely covered one square kilometer, and was occupied mainly by their homes while the indigenous population settled the surrounding outskirts. It was considered simply as a place where caravans stopped to rest on their way to Potosí and Lima, a resting place between other cities on the Altiplano. Other than that, its only main attraction was a fairly popular annual fair. Over time its silver production became more relevant, and the area more prosperous, although this still didn’t attract enough people to transform it into an opulent metropolis, as Potosí was, or a cultural or education center, such as Charcas (now Sucre). Because of its rugged topography it also couldn’t become the food heartland of the Colonies, like the valley region. Thus, it was nothing more than a small miner’s town, nothing flashy, until one day a judge from the Audiencia de Charcas, Don Miguel de Castro y Padilla, took a look at the town and decided to re-found it. On the 1st of November, 1606 he proceeded to announce its official foundation, gave it a new name “Real Villa de San Felipe de Austria” in honor of the king of Spain, Felipe III (who was of the Spanish branch of the Hapsburgs of Austria). Between the 16th and 18th Centuries Oruro, Potosí and Peru were the source of almost all the silver and gold which, among other things, were employed by Spain in its endless attempts to own “half the world and the other half by war”, as writer Pérez-Reverte describes. Spain wasn’t exactly on good terms with England, France, and the Netherlands and between the four of them their disputes extended into their respective colonies. Oruro didn’t directly suffer the consequences of this, but the system of government, with its legislative rigidity, its centralism and almost non-existent reinvestment of all this wealth into the colonies that produced it, caused discontent throughout the entire territory. In Oruro there was also discontent among the Spaniards and mestizos (people of mixed Spanish-indigenous race) and prior to the Wars for Independence there had already been an uprising. Mining had very strong social and environmental impacts in this region. The indigenous people of the area were enslaved to work in the “socavones” or “mitas” (mines) and their mortality rates increased due to exhaustion, mistreatment, and pulmonary illnesses caused by the humid, poorly ventilated mines, in addition to other diseases they contracted from their masters. The Yanaconas, natives who were not “mitayos” (miners), were employed in housekeeping duties or were peons on existing ranches and “llameros” (guidesmen for mules and llamas used as pack animals). The social structure and customs brought over from the other side of the world were assimilated little by little by the natives who began to use Spanish, mixing it with their native languages, while also mixing the Catholic religion into their own animist rituals, creating some of the unique rituals that still exist today. Mixing races was not unusual, although the children of Spaniards and natives were considered socially and racially lower than their Spanish parent and above their native parent, creating a new caste: the Mestizos. Ecologically, mining decimated the native flora. Forests and all other vegetation that could be used as lumber were cut down over several hundred years and employed in used as beams in the mines, for construction, and dozens of other uses. The only thing left now is straw and dry brush. The rebellion against Spain reached Oruro before it reached Charcas, on the 10th of February, 1871. However the republicans, commanded by Sebastián Pagador, the Rodríguez brothers and the Menacho brothers, were promptly silenced. When the Wars for Independence began anew in 1810, the patriots from Oruro, now led by Esteban Arze, defeated the Spanish Royalist Army in the battle of Aroma, in October of the same year. They won their independence and remained free until the República de Bolivar (now Bolivia) was officially created in 1825. The president of the new nation, Antonio José de Sucre, declared Oruro a department (state) on the 5th of September, 1826. In its new position, Oruro continued to be one of the two main mining centers throughout the entire republican era, garnering great wealth from the tin and other metals which the ongoing global Industrial Revolution needed in great quantities. The mines, however, were owned by just a handful of overlords such as the famous Simón I. Patiño, known as the “Tin Baron” who became one of the wealthiest men in the world. Later, the mines were owned by a few large international mining companies. 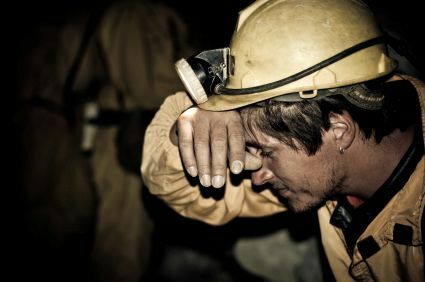 During the past century the mines have been nationalized, privatized, and then nationalized again depending on how the winds of government policy blew. Oruro still depends on the exploitation of its minerals to move its economy and there are some very ancient mines, such as Paria, foundries, such as Vinto, and mining towns like Huanuni, among others that can be visited by tourists. Despite this, Oruro owes its fame to its Carnaval above all else. The Carnaval de Oruro is a unique display of folklore declared the “Oral and Intangible Heritage of Humanity” by UNESCO in 2001. Some claim it has existed for 2000 years, dating back to the animist rituals practiced in the mountains surrounding Oruro. What we do know is that Pre-Colombian peoples built sacrificial alters in the mountains, as can be evidenced from the remains of sacrificial stones, liturgical instruments, and sometimes even mummies in caves and open areas. On the other hand, the Uru’s religion revolved around two annual agricultural festivities called “anatas”, one during the planting season and one at harvest time, during which the people evoked the gods of the natural elements, the sun and the rain, to guarantee a good harvest. During these festivities competitions of skill were common such as hunting Andean deer, domesticating wild llamas, and the wassail (a toast) to the god of the rain, known as “el Tiu”, to the spirit of the mountains and to the Supay, the demon who was the custodian of the wealth found in the mountains. The Quechuas, who dominated the Uru, were incapable of stamping out these customs and allowed them, albeit reluctantly, as long as their gods (the sun god Inti and the mother god Pachamama) were included. With the arrival of Catholicism imported by the Spanish conquistadors, the natives did not renounce all of their beliefs, they simply varnished them with Christianity in order to keep their new masters’ gods content. This is how the cult to the Virgin Mary was introduced and mixed with glaringly pagan rituals which the Catholic Church frowned upon but tolerated with resignation in order to convert the natives. Thus was born in 1789 the idea to attract the stubborn natives to Christianity with an ingenious scheme. An image of the Virgin Mary appeared, who knows how, in a socavón (mine) in the Pie de Gallo mountain, and this being considered miraculous, it was taken as proof that the Mother of God demanded a church dedicated to her devotion. Religious like few others, the miners followed the recommendation and soon the painted mural of the Virgin of Candelaria, who they call the Mamita del Socavón (mother of the mine) was venerated in a three-day feast during the same dates on which the “anata” festivities normally took place (in February, the month of rain). Oruro, Bolivia Slideshow: BoliviaBella.com’s trip to Oruro was created with TripAdvisor TripWow! The first day they called Sábado de Peregrinación (Pilgrimage Saturday), the second day Domingo de Carnaval (Carnaval Sunday), and the third day Lunes del Diablo (Devil’s Monday). On these three days they danced wearing costumes of the “supay” (the demon of the mines), a volatile spirit in charge of the veins of metal found in the mines, to whom one had to ask permission and approval to extract gold and silver otherwise he wouldn’t provide a single nugget. This is how the famous Diablada dance, now Bolivia’s emblemic dance, was introduced into the Carnaval de Oruro. The origins of the Diablada (the Devil Dance) are disputed by Potosí, where people say it originated in Aullagas, a mining town founded by the Spaniard in 1538, where miners have the peculiar tradition of hanging masks of the devil at the mine entrances. This and other uncountable pieces of evidence, according to those who support this hypothesis, are proof the Devil Dance originated here and wouldn’t be what it is without the monstrous masks as part of the costume. Others who claim to be the originators of this dance, although with less conviction, are the Chileans and Peruvians who assure the dance is of Aymara origin and therefore, they claim they should have the right to present it as their own as they have Aymaran populations (in northern Chile) and near Puno, Peru. In any case, the first time the Diablada was danced with the costumes it is now singularly known for was in 1904 during the Diablada de los Matarifes. In a museum in Oruro you can see a sample of the costume that was used. It included white pants, a white tunic, a shiny mesh with a pleated skirt, miner’s boots, a red cape, and the mask of the “supay”. Today the design is much more elaborate, much heavier, much shinier, and has a mask that covers the entire neck and head that is much larger than the original, which was more like a facemask. Another addition is that now women dance too and are called the “china supay” (female devils). The groups of Devil Dancers are now complemented by other dancers dressed as animals that are symbols of the Uru mythology, such as the bear and the condor, and they all dance to the rhythm of a whistle blown by the lead dancer who is dressed as the Archangel Michael. 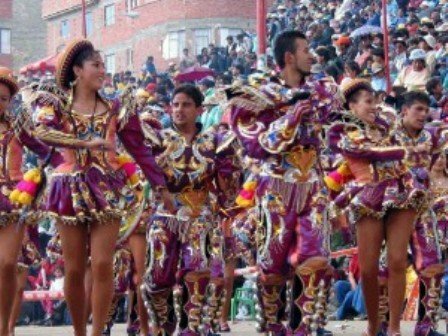 Not all of the dances you see during the Carnaval de Oruro are originally from Oruro. For example, the Suri Sicuri is from La Paz, the Tobas are from the Chaco region, and the Caporales are from the Yungas. They aren’t included because they are from Oruro, but because Carnaval is now a Bolivian heritage known throughout the world and this is a way to showcase the entire country’s wealth of folklore, be it from the Altiplano, the valleys or the plains. 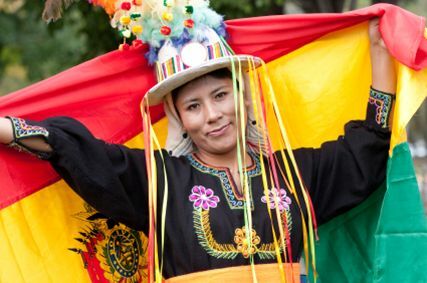 Thanks to this, Oruro has earned the title of Folklore Capital of Bolivia.